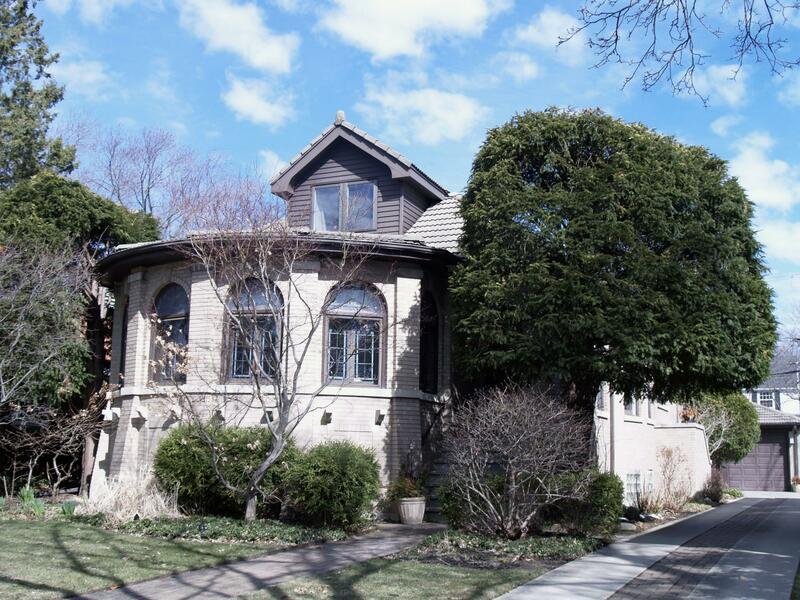 Significance: This one-and-a-half story Chicago Bungalow has massing typical of its type but unified and well-designed; a rounded bay, adjacent to the entrance porch, projects from the basically rectangular structure; arches repeat the rounded shape, porch is entered under a rounded arch with a raised keystone, and the wood doorway just beyond is arched; rounded arches with raised keystones also top the four windows, separated by pilasters, in the front bay; beautiful stained-glass windows with lime green glass form fanlights in the arches; in addition to the arch motif, coloration visually ties the building together; it is entirely of buff-colored brick with light-colored limestone accents; the brick work is set in common bond except where it is used in a basketweave pattern under the windows; the room is sand-colored tile. Other Permit Information: 22-April 1929. BP#18939 for a 1-story frame 2-car garage. Owner: W. G. Mersch. Cost: $500. 18-July 1950. BP#27304 for a 1-story brick and concrete screened rear porch addition. Size: 15'W x 15'L x 10'H. Owner: Frank Sammons. Cost: $1,800. 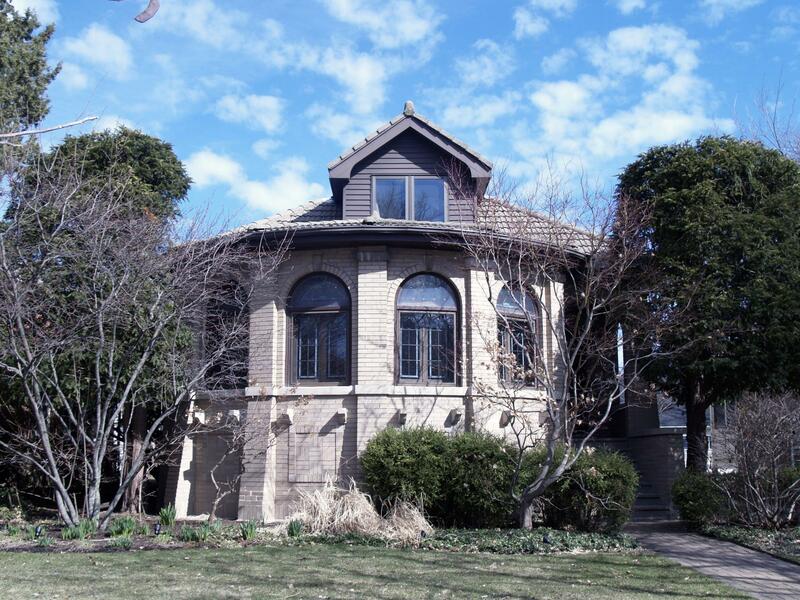 Historic Info: Source: Evanston History Center Archives (3-ring binder) STATEMENT OF SIGNIFICANCE: A7 In an area dotted with bungalows, this one-and-a-half story brick structure commands attention. Its massing is typical but unified and well-designed. A rounded bay, adjacent to the entrance porch, projects from the basically rectangular structure. Arches repeat the rounded shape. The porch is entered under a rounded arch with a raised keystone, and the wood doorway just beyond is arched. Rounded arches with raised keystones also top the four windows, separated by pilasters, in the front bay. Beautiful stained-glass windows with lime green glass form fanlights in the arches. In addition to the arch motif, coloration visually ties the building together. It is entirely of buff-colored brick with light-colored limestone accents. The brick work is set in common bond except where it is used in a basketweave pattern under the windows. The roof is sand-colored tile. Taken as a whole, this is a particularly handsome example of a prolific building type. Other Sources: 18-April 1929 Plat of Survey on file at the Evanston History Center house file.